Based in Mitcham, Surrey and catering for both domestic and commercial markets we can help clients create their dream custom staircases by using the materials and finishes of their choice. Projects are characterized by detailed consideration at every stage of planning and construction this is done through our Project Manager and the use of our Inhouse Autocad System. 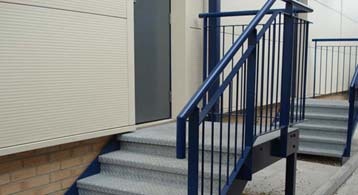 Our bespoke external steel staircases include many different designs such as straight flight, quarter turn, half turn and spiral steel staircases. Each staircase can be fully customized with a wide range of handrail, balustrading and tread options to suit all uses and complement any colour scheme. We have also created many unique commissions for centerpiece stairwells using a range of materials such as glass, and stainless steel.